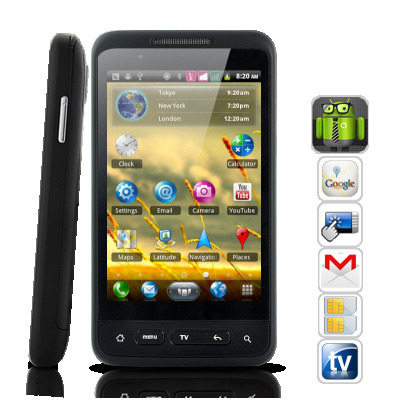 Successfully Added Android Phone "CyberJam Plus" - 3.8 Inch Multi-Touch Capacitive Touchscreen, Dual SIM, 3G to your Shopping Cart. Sporting dual SIM card slots, a brand new MTK6573 chipset, and a HUGE 3.8 inch Multi-Touch Capacitive Touchscreen, the CyberJam Plus Android 2.3 Smartphone is here to impress. But be warned: Limited supply of this smartphone means once we sell out of our current stock, it is GONE. Don't pass up your chance to own a powerful and affordable 3G android phone now! The new MTK6573 chipset is the latest chipset that came out in late 2011. With the ARM platform and core speed of 650 MHz, the MTK6573 makes the CyberJam Plus faster, more powerful and fine tuned for stronger multi-tasking capability. Factory testing performance of Android 2.3 smartphones with the MTK6573 chipset (like this one) puts it on par with the likes of the Samsung Galaxy Nexus. The CyberJam Plus Android Smartphone comes with a vibrant, bright, and massive 3.8 inch touchscreen that responds immediately to your touch. This allows you to easily slide your finger across the smooth screen to navigate through web pages, photos, eBooks, and more with the ultimate ease. From playing games to surfing the web and reading online reviews and news, the multi-touch feature ensures fast response rate in zooming and viewing websites that is easy on the eyes, and hassle free. High quality, amazing price - but stock is limited! With the CyberJam Plus, programs load faster, games play smoother, and you can feel the difference in quality. Know that you have a top-of-the-line device in your hands. This affordable Android smartphone is also the best bang for your buck today and brought to you at a factory-direct price that can't be matched. But be warned: Limited supply of this smartphone means once we sell out of our current stock, it is GONE. Don't pass up your chance to own a powerful and affordable 3G android phone now! Chinavasion proudly provides a 12 month warranty, next day shipping and dedicated quality customer service. So don’t look back, order today and receive an amazing phone for an amazing price from Chinavasion, your wholesale choice for high quality android smartphones. Access hundred of free apps, games, ringtones and much more with the Android Marketplace! Comes with Youtube, Facebook, Gmail, Yahoo, eBuddy, Weather, Google Talk and much more! LAST WHOLESALE STOCK: Gone is gone! on 2012-05-17 00:32:34 Good stuff!